Steedman’s division reforms on the next ridge north of Horseshoe Ridge. Johnson’s Division follows, but stops short of the ridge. The 89th Ohio and 22nd Michigan, on detached service with Whitaker’s brigade, are ordered back to their position on Hill Three. 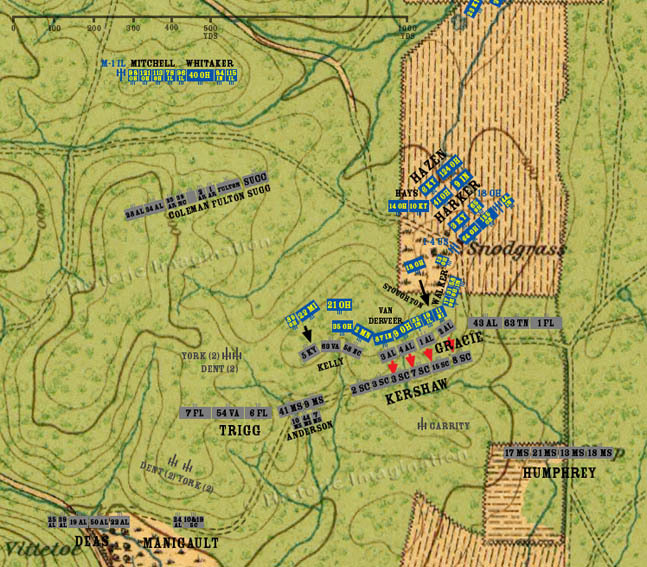 The 18th Ohio of Stoughton’s brigade counterattacks the Confederates on the opposite slope of Hill One. They fall back to the bottom of the hill, as does the remainder of Gracie’s Brigade. One section each from York and Dent’s Batteries moves forward and sets up on Horseshoe Ridge facing north.